Getting the timings right for Christmas dinner can seem a nightmare, but if you follow our step-by-step guide, you shouldn’t go wrong. The secret to taking the strain out of Christmas for the cook, is to plan as much as possible well ahead of time. There are many elements of the meal that you can freeze, or pre-prepare which will free up your time on the big day itself to concentrate your efforts on the turkey. Yorkshire puddings, sauces, starters, desserts can all be made in advance and popped in the freezer, whilst vegetables can be peeled and prepared the night before. How many are coming to Dinner? The first thing to do is to know how many you’re cooking for and buy a turkey which amply allows for second helpings, extra carvings for Boxing Day and hopefully sandwiches for a few days afterwards! As a guide, a 12-14 lb (5.5-6.5 kg) turkey will comfortably feed most families. Once you get your turkey home, make sure you weigh it again (as there can sometimes be some variance). Bathroom or luggage scales can come in handy here if your regular kitchen scales are struggling, but remember to protect and clean any surfaces which come into contact with the raw meat. Once checked, you can then work out your timings accurately. At this point, it is useful to grab pen and paper and write everything down. Whilst you think you can hold the timings in your head, there is so much else happening on Christmas Day, it’s easy to lose track. Keep your timetable to hand – perhaps stick it on the wall near your oven – for easy checking throughout the day. 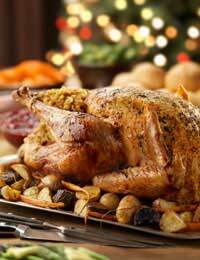 A rough guide to roasting turkey is to allow 20 minutes cooking time per lb plus 20 minutes. All birds and ovens vary, so these timings are only approximate, but by doing a simple test, it is easily possible to check if the meat is cooked. To work out your plan, decide what time you wish to serve dinner, then allowing for any last-minute panics, work backwards to determine the time your turkey should go into the oven. If you are stuffing your turkey, don’t forget to allow time to do this beforehand. Turkeys should always be brought to room temperature before cooking (so remember to take out of the fridge the night before!) and started off in a very hot oven for the first 30-40 minutes of cooking time depending on the size of the turkey. This ensures any ‘bad’ bacteria are killed and that heat can penetrate fast into the main cavity of the bird. The oven, then, should be pre-heated to 425 degrees F/220ºC/gas mark 7. At the end of this initial period, the temperature should be turned down 325 degrees F/170ºC/gas mark 3 for the majority of the cooking time. About an hour from the end, remove any protective foil or bacon you may have used to stop the breast from drying out and again increase the temperature of the oven to 400 degrees F/200ºC/gas mark 6. This will help the skin to crisp and brown off nicely. During the next half hour, baste the turkey as many times as possible to help keep the meat succulent and juicy. 30 to 45 minutes before you wish to serve dinner, take the turkey out of the oven and leave to rest or ‘relax’. This helps the juices which have risen to the surface during cooking, to return to the meat and keep it moist. It will be quite happy left waiting whilst you then finish off the vegetables and make the gravy. It would then be removed between 1.15p.m - 1.30pm for serving at 2.00pm. If you are unsure whether the turkey is cooked, take a skewer and insert it just under the thigh joint. If the juices which bubble up run clear, then it is cooked, if they are still pink, then return to the oven. Above all, don’t panic – your meal will be wonderful and all will enjoy! Take a look at some more ideas for Christmas day food.